Update: The Apple Store is down, which could be a hint that the iPad Mini 5 is about to land. The iPad mini 5 release date is expected in 2019, and Apple may launch it in the next month or so, or perhaps even today (March 18) according to the latest leaks regarding the long-awaited tablet. It couldn&apos;t come sooner for those clamoring for an upgrade to the last 7.9-inch iPad – it launched back in 2015. It has really been that long since we got the old iPad Mini 4. We&apos;re also anticipating an entry-level iPad 9.7 in March or April, so Apple could unveil both new iPads at the same time. How Apple will price them remains a mystery though. The iPad mini 5 will have to come cheap due to its smaller screen size, but it&apos;s said to offer new features, including Smart Keyboard and Apple Pencil support. More specifically we might see the iPad Mini 5 on the week commencing March 18, or even on March 18 itself (that&apos;s today at the time of writing), as the Apple Store went down on that day, which is often a hint that new products are launching. On the other hand, mid-April is when we expect Apple&apos;s video streaming service to go live. The company could tie the iPad Mini 5 and video service into one big launch event. Even if the video platform goes live in April, the launch event could still happen in March because Apple doesn&apos;t have a video streaming service it&apos;s replacing. It can afford a longer lead time vs products in which people will stop buying the old one. Indeed, Apple is holding an event on March 25 where the video service might be announced. So we could also see the iPad Mini 5 there. In fact, the iPad 9.7 is cheaper right now, starting at $329 / £319 / AU$469, while the iPad mini 4 starts at a premium $399 / £399 / AU$579 (albeit that&apos;s for a hefty 128GB of storage, which is the only size it&apos;s currently sold in). We&apos;re left wondering if the iPad mini 5 will cost more than the iPad 2018 (and maybe the iPad 2019), despite the fact that it has a smaller screen size. Pictured below, you can see that the main difference to the iPad Mini 4 is that rather than having a big antenna block on the cellular model, there&apos;s just a slim line. That improves the look, but might be the only change on the back. Everything else looks similar, including a headphone port on the top edge, speakers on the bottom, and volume buttons on the right. The images also suggest you&apos;ll be able to buy it in gold. We would however take these images with a pinch of salt, as this is our first sighting of the slate. The iPad Mini 5 is also likely to retain the home button, large bezels and Touch ID, even though the iPad Pro 11 ditched those things. That&apos;s because reports suggest this will be positioned as a fairly affordable option, so we&apos;d expect it to have more in line with the iPad 9.7 (2018) and indeed the iPad Mini 4. The only screen rumor so far comes from analyst Ming-Chi Kuo, who says the slate will have a "lower-cost panel." That likely means an LCD one rather than the OLED panels found on the likes of the iPhone XS, and it also probably won&apos;t have fancy features like the 120Hz refresh rate found on Apple&apos;s latest iPad Pro slates. It’s also likely to stay at a 1536 x 2048 resolution, given that this amounts to a pixel density roughly the same as the iPhone XR and higher than Apple&apos;s other slates. 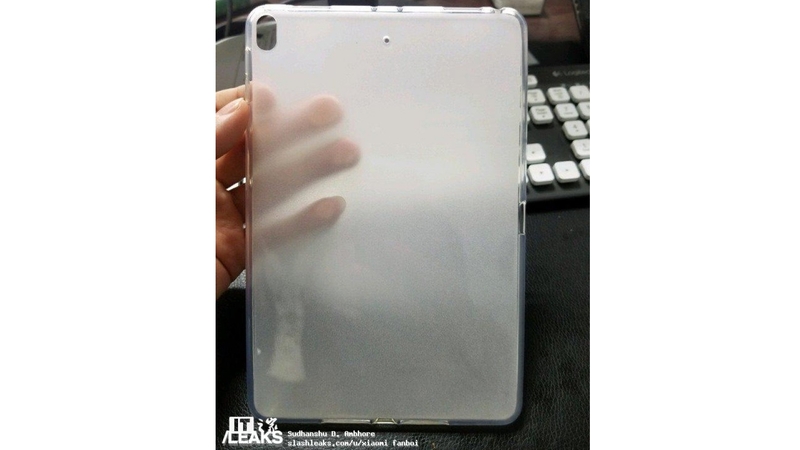 However, a case supposedly for the slate has also been photographed and shared by SlashLeaks and ITHome. You can see this below, and note that the case has a cut-out big enough for a flash. We wouldn&apos;t count on a flash, as the iPad 9.7 (2018) doesn&apos;t have one, but the iPad Pro 11 does, so it&apos;s possible. Our best guess is that it will have the same cameras as Apple&apos;s latest budget 9.7-inch iPad, which itself has the same ones as the iPad Mini 4, namely an 8MP f/2.4 rear camera and a 1.2MP f/2.2 front-facing camera. However, there&apos;s an outside chance that it will instead get the same cameras as the iPad Pro 11 (a 12MP f/1.8 rear camera with a flash and a 7MP f/2.2 front-facing one), or something even better. Apple’s iPad Mini range doesn’t always have the most cutting edge chipsets, so while the iPad Pro 11 is using Apple&apos;s brand-new A12X Bionic chipset, the iPad Mini 5 may well stick with something slightly older, like the A10 Fusion from the iPhone 7 and new iPad (2018), or the A11 Bionic from the iPhone X. The only news on that front comes from analyst Ming-Chi Kuo, who says the iPad Mini 5 will have "an upgraded processor", which doesn&apos;t tell us much, since we&apos;d be very surprised if it didn&apos;t.
And it may not get any improvement in RAM at all, as the iPad Mini 4 already has 2GB of the stuff – the same amount as the iPad 9.7 (2018). That&apos;s less than some Apple devices, but this isn&apos;t likely to be a top-end device. Assuming the iPad Mini 5 launches fairly soon it&apos;s also sure to run iOS 12. We&apos;re not expecting many new features from the iPad Mini 5, but it might support the Apple Pencil, given that the iPad 9.7 (2018) does, despite not being a top-end slate. Of course, that&apos;s if Apple doesn&apos;t decide the Mini 5 is too small to work well with a stylus. There&apos;s also a chance that we could get more and better speakers for improved sound, much like the Pro range has, and a Smart Connector for attaching a keyboard, though these additions are probably less likely than Apple Pencil support. It&apos;s a real long shot but there&apos;s also an outside chance that the iPad Mini 5 will get Face ID. This has been included on the iPad Pro 11, but we expect Apple will keep the feature for its more expensive range of slates.